To Dog With Love: Wordless Wednesday: Woof Gang Bakery Stop on the Simply Buckhead Pet Boutique Tour! Wordless Wednesday: Woof Gang Bakery Stop on the Simply Buckhead Pet Boutique Tour! First, some not-so-wordless Wednesday to address the critical needs in Japan, and then we'll get to some much-needed Wordless Wednesday love. Please join us tomorrow to help spread the word about Paws for Japan, a day when the pet community will come together to support relief efforts for animals in Japan. Led by BlogPaws Be the Change for Pets, we'll spread the word and help raise funds for World Vets, an organization dedicated to providing veterinary aid worldwide. The first World Vets responder deployment is en route to Japan to support a coalition of Japanese animal welfare groups. You can read a little more about it on Pawcurious and get codes for all the badges and other idea from BlogPaws. Also, donations can be made by clicking "ChipIn!" on the Japan Animal Aid widget on our right sidebar. You might also like to know about Dog Bless You, a wonderful organization that champions the selfless acts of animals. We had the chance to hang out with them at SXSW and tell you more about them here. We recently toured our favorite local pet boutiques for an article in Simply Buckhead magazine. Today's feature comes from Woof Gang Bakery Buckhead! In addition to having incredible baked goods for dogs and a full supply of pet products, Woof Gang Bakery hosts lots of events to help raise money and awareness for animal causes. 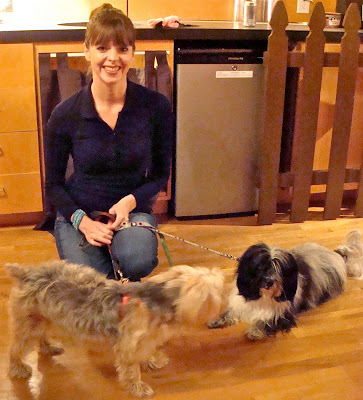 At a recent event, Cosmo and his pal Frankie from BarkWorld got a chance to visit with Victoria Stilwell from Animal Planet's It's Me or the Dog! The fabulous table of bakery goods for dogs is the focal point of the store! Cosmo hopes some baked items will fly off the table and into his mouth! On our trip last weekend to SXSW, we got to meet our pal @WrigleySchnauzr! 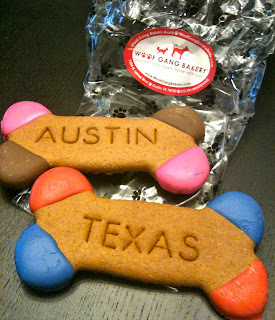 He sent these treats home to Cosmo from the recently-opened Woof Gang Bakery in Austin! Here's more about our recent tour of Atlanta area pet boutiques. friv games online | friv online games | papa’s games | Juegos de deportes | Juegos 1 Really a great post which clear my all doubts regarding auto responder.